The Starss Icon Pod Starter Kit is so elegant that nobody will refuse it! It works with 380mAh built-in battery. The 2.0ml juice capacity and 1.7ohm coil resistance make it a simple device for easy vape. The Starss Icon is the first carbon fiber pod kit too. The round pod design of Incon brings comfortable hand feel to vapers. Plug out the pod then you are capable of refilling the cartridge at the bottom. The Incon is an air-activated kit, so it's button-free. Take the Starss Icon Pod home! 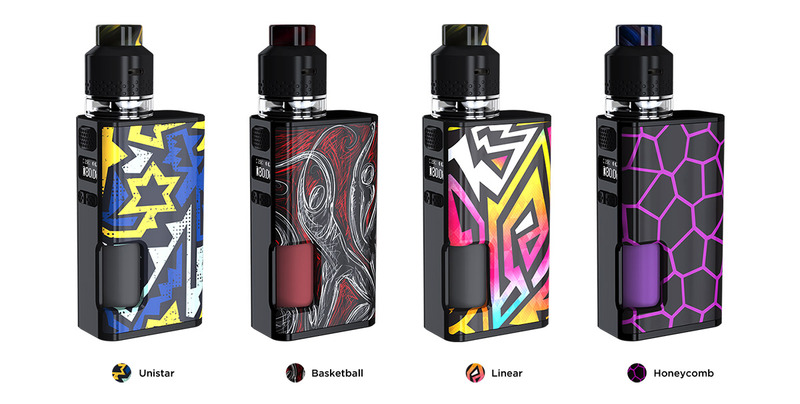 Wismec Luxotic Surface, the smallest squonk box with 0.49inch OLED screen, is compact and ergonomic enough to lead the vaping industry. Powered by single replaceable 18650 cell, Wismec Luxotic Surface is capable of firing up to 80W, offering you more powerful output than ever. Kestrel, an innovative RDTA, features its brand-new mesh heater design with larger heating area for optimal flavor and vapor cloud. With Wismec Luxotic Surface Kit in hand, squonking has never been so simple.